Family trips – great photo opportunities? If planned well, family trips could provide great opportunities for a dedicated photographer. While photography-centred trips are ideal, they require plenty of time and preparation. Such photo assignments also demand 100% dedication, which, at least in my case, is difficult to achieve when accompanied by family or friends. Maybe it is just me but my approach to photography is very personal and methodical. While taking photos I like to concentrate on a subject, visualize and compose it in my mind before I take out my camera. If taken seriously, this mental effort doesn’t tolerate any distractions – whether it is a discussion, loud noise or even a telephone conversation. Of course such a state of mind is not always possible. I am very lucky in this regard because my wife and my son support me whenever and however they can during our trips together. For example, when we plan family trips (vacations, shopping or just road trips) I always try to squeeze some photography into our schedule. Fortunately, my favourite lighting conditions are usually very early in the morning or late in the evening, which allows me to plan my photography so that it doesn’t disrupt my family’s overall experience. During our recent trip south of the border, we were driving toward Seattle to do some sightseeing and shopping. 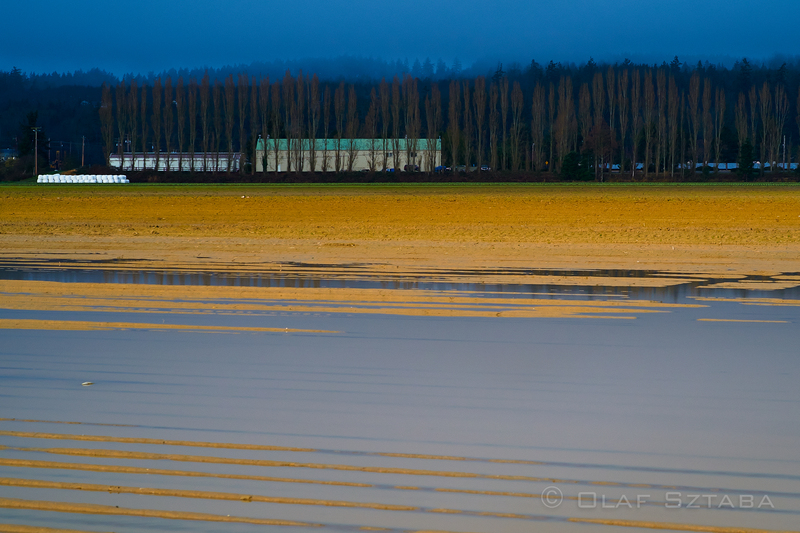 I knew that 10 minutes west off Highway 5, I could reach Skagit Valley with truly spectacular rural vistas and the historic town of La Conner. Since the stores and attractions don’t open until 10 a.m. I had a 3-hour window during which I could do some location scouting and take photos. In fact we left earlier than planned and on the way to Seattle I was able to capture a few images and found some really fantastic locations for my next photo trip. So for even short family escapades, you can often plan a way that will allow you to scout locations or even take a few images. In fact, many of my favourite images were taken during such trips. You never know. Below please find some images taken during this short opportunity. All images were taken with the Fuji X-Pro1, X-E1 and various XF lenses. Processed in Capture One 7 and Lightroom 4. Very nice. I’m looking forward to checking out more of your blog.